Centro de Treinamento e Apoio Missionário or CTAM (Missionary Training and Support Center) was established in 2015 in the city of Nova Granada, Brazil. Its aim is to mobilize the body of Christ for the following tasks related to the Great Commission – the training and support of Christians who are willing to serve in missions. Tiago & Barbara are passionate about the Great Commission. Tiago describes himself as a missionary kid, having lived in a number of countries while his parents were missionaries. He speaks Portuguese, Spanish and English and received a bachelor of theology degree from Horizontes America Latina. Tiago currently serves as the executive vice-president of CTAM. Barbara, on the other hand, is a pharmacist by trade. She graduated with a degree in pharmacy and hematology from Paulista University. As she serves alongside Tiago, she also ministers to children. There is a creative side to Barbara who fashions handicrafts that she sells to raise funds for their personal ministry. Like Tiago, Barbara speaks Portuguese, Spanish and English. Tiago and Barbara desire to be used of God in the raising up of the next generation of Brazilians who will go as missionaries to every corner of the world, reaching the unreached. GLINTS welcomes CTAM and the Medeiroses to its growing family of partner ministries and global staff members. Electronic funds transfer is the best way to deliver your monthly support. Click here for instructions. You can donate via credit card by clicking the DONATE or PayPal button below. The Good News Church Bangladesh (GNCB) was founded by Pastor Prodip Karmakar in 2014. With a burden for Bangladeshis to know Jesus Christ, Pastor Prodip uses a holistic approach to ministry, addressing not only the spiritual needs of Bangladeshis but also their emotional, physical and academic needs. Church planting through gospel proclamation is of primary importance to GNCB. By establishing ministries among children, women, the handicapped and survivors of disasters (both natural and manmade), Pastor Prodip, seeks to impact the lives of thousands of Bangladeshis with the Word of God. Aside from having experience as a social worker, Pastor Prodip has been ministering with AWANA Clubs International since 1989, currently serving as AWANA’s national coordinator for Bangladesh. Together with his wife, Shikha, Pastor Prodip also runs two orphanages. On March 28, 2018, the Good News Church Bangladesh denomination signed on as a partner ministry of GLINTS. Together, GLINTS and GNCB will also explore ways of answering the call of caring for Rohingya refugees from Myanmar. For more information about GNCB please contact Pastor Prodip Karmakar. You can participate in the GNCB’s ministry by praying for this young denomination and supporting it financially. You can give via credit card or PayPal by clicking the DONATE or the PayPal button below. How precious are the feet of those who bring good news . . . by wheelchair. A much-prized commodity among the mobility-challenged, GLOW (God’s Love On Wheels) partners with local churches in the PCEC (Philippine Council of Evangelical Churches) network all over the Philippines to not only provide mobility but also community. Pastors in a locality are tasked to identify the truly needy, build relationships and provide emotional and spiritual care to recipients and their families as well. GLOW was borne in the heart of Filipino-American missionary to Japan, Bola Taylor. Even though Bola has joined her heavenly Father (October 2015), GLOW is moving forward with Bola’s vision. Judy Raymundo, executive director, provides inspiring leadership to GLOW. Though used, these wheelchairs are refurbished with love and care by volunteers of Wheelchairs of Hope (WOH) based in Japan. WOH collects the wheelchairs, repairs them and finances the shipping of these used wheelchairs. GLOW, in turn, receives the shipments from Japan (with the assistance of PCEC-PhilRADS (another global partner of GLINTS), and disseminates them with no cost to churches nor the recipients. You can donate online by clicking the donate and PayPal buttons below. SSIM is a mission organization committed to raising up Christ-followers in the Caribbean. A duly registered non-government organization in the Country of Curaçao, SSIM seeks to make disciples through sound biblical teaching in schools, conferences and outreach events. SSIM also serves as a mission board for future workers in the Caribbean, supplying literature, music paraphernalia and training in biblical stewardship. Ed and Luisette Kraal hail from the island-country of Curaçao. Answering the call to further their theological education, they left their marketplace careers and received educational degrees from the Baptist University of the Americas, culminating in their receiving masteral degrees in intercultural ministries from the Moody Theological Seminary. They feel it is time to return to the Caribbean, teaching God’s Word not only to make disciples but to strengthen the Caribbean Christian community as well. Ed and Luisette have one daughter, Jo-Hannah. GLINTS welcomes Saved to Serve International Ministry (SSIM) and the Kraals to its growing family of partner ministries and global staff members. You can donate via credit card by clicking the donate button below. Decisión is a Madrid-based evangelical nonprofit organization committed to sharing Christian values and communicating the message of Jesus Christ to the world. Its purpose is to serve individuals and churches seeking the advancement of justice, peace, freedom and hope. Decisión makes available various media resources to churches and individuals, conducts research and reports on the changing spiritual trends in Spain, organizes evangelistic campaigns and offers training in evangelism in post-modern Europe. Projects of Decisión address the needs of people from a holistic and comprehensive point of view, hence, the inclusion of social, cultural and religious programs. It is easy to designate your giving to our different projects. A Prayer for Spain seeks to enlist prayer for towns in Spain without an evangelical witness with the goal of seeing churches planted in those towns. More than 10 million Spaniards live in these areas and your prayers may affect their destiny forever. You may adopt a town for prayer by clicking here and donate to this project here. Here’s a unique opportunity for youth aged 16 and older to bring God´s love to the most needy communities in Spain. During the festival (12 days in Spain) participants learn to share their faith in many different ways: volunteer work, sports, mime, illusionism and creative activities for children. Through lectures and workshops, participants get to know the Word of God which may lead to discovering and/or developing their abilities and gifts for serving God. Register here for the summer festival. To donate click here. ONN is Decisión’s version of Operation Christmas Child (OCC). Since its inception in 2009 Decisión and cooperating Spanish churches have collected, assembled and distributed over 100,000 shoeboxes to needy children mostly in Equatorial New Guinea. Although ONN is a collaborative initiative between Decisión and Samaritan’s Purse, Decisión does not receive any funding from Samaritan’s Purse. To donate to Operación Niño de la Navidad and bring joy to needy children click here. FestivalPhos is an online video ad contest created to communicate the message of Jesus Christ and the Judeo-Christian values. Its objectives are to promote audiovisual creativity and create a video library of useful ads to share the Gospel and Judeo-Christian values. It also provides a platform for creative Christians to use their talents for God’s glory. To donate click here and designate to FestivalPhos. Decisión rejoices that many prison inmates in Spain have become believers. The challenge is to provide discipleship materials to them. These inmates can learn more about their faith in Jesus Christ by receiving Decisión-produced materials. Your donation towards this project will help in the discipleship of thousands. Click here to contribute. Decisión is registered with Spain’s Ministry of Justice and a member of the Federation of Evangelical Religious Entities of Spain (FEREDE). Electronic funds transfer is the best way to establish your monthly support of Decisión. You can donate via credit card or PayPal by clicking the appropriate button below. JBF (Japan Baptist Fellowship) has been involved in Japan since 1947. They envision people and communities transformed by the love and power of Jesus as it partners with missions-focused movements, not only Japan, but throughout the world. JBF has dynamic partnerships with missionaries from all over the world focusing primarily in serving the national Japanese church. 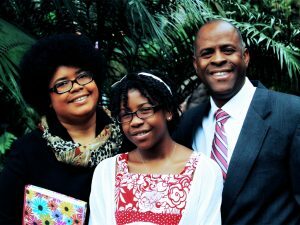 Willy and Cora Bulseco are international partner missionaries under the JBF banner. 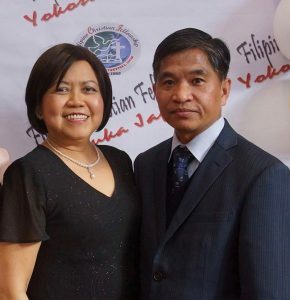 Willy and Cora Bulseco have been serving the Lord in Japan for two decades, first as bi-vocational missionaries and second as full-time pastor (Willy) since 2005 of the Filipino Christian Fellowship (FCF) which operates under Command Fleet Activities at the Yokosuka Naval Base. Willy and Cora have one daughter they fondly call KC. As JBF international partner missionaries, the Bulsecos provide a valuable service to navy personnel based at the Yokosuka Naval Base who deploy for long periods of time. They leave knowing their families are ministered to by the FCF family. GLINTS welcomes the Japan Baptist Fellowship and the Bulsecos to its growing family of partner ministries and global staff members. A different kind of child friendly space? Learning from partnership in the response to Typhoon Haiyan Click here to view the Executive Summary. Arising from the recognition of the need for a coordinated effort among churches and para-church organizations in responding to the hardships of children in the Philippines, PCMN was established in 1998 by the Philippine Council of Evangelical Churches (PCEC) as the Commission on Children. Vision: Protecting Filipino children as we restore lives together. We convene, develop and deploy networks of individuals and faith-based organizations, equipping them to effectively collaborate in strengthening and increasing child protection mechanisms. Restore Eastern Samar Together (REST) – a program in response to the devastation wrought across Eastern Samar by Typhoon Haiyan (Yolanda). REST focuses on increasing and strengthening the child protection mechanisms in 6 municipalities within Eastern Samar province (Lawaan, Balangiga, Giporlos, Quinapondan, Hernani and Balangkayan). The program targets to effect constructive change in the lives of 17,000 children in vulnerable circumstances due to disaster. SAFE CHILD – works directly with children and empowers them to protect themselves. Through three projects, PCMN is: 1) providing psychosocial support to elementary school children, 2) engaging vulnerable adolescents in leadership development, peer mentoring, and community involvement, and 3) managing the cases of 150 children in need of special protection in collaboration with the Department of Social Welfare and Development. SAFE SCHOOL – supports children by strengthening the capacity of educational institutions in the area through facilities development, teacher training, the provision of scholarships, and after-school programs. SAFE FAMILY – supports children who are beneficiaries of REST by working with their parents to develop positive parenting skills, and to educate them in small scale organic farming in an effort to establish sustainable food security. SAFE CHURCH – develops the capacities of local churches for integral mission in their engagement with local government units and their respective communities as they implement programs for children. PCMN has a volunteer force of over 100 workers drawn from various network member churches who serve in various capacities. SAFE GOVERNANCE – works with local government units to strengthen the barangays and the Municipal Councils for the Protection of Children. PCMN advocates for the localization of the ordinances and policies that support the development of caring, protective environments for children at the grassroots level. Youth for Safety (Y4S) – is an initiative to reduce, prevent, raise awareness and create more action against sexual child abuse. It primarily involves 100 youth advocates from 51 PCMN member organizations who reach out to 7,500 children and youth who are at-risk to sexual abuse, exploitation and trafficking. The project also works with parents, church congregations, community members, local police, teachers, community leaders, and government policy makers to create safe places for children and youth. Church Recovery Program – aims to help in the repair of damaged church facilities and houses of pastors in six (6) towns affected by Typhoon Yolanda. This program has also been extended to include the more recent Typhoon Ruby affected areas. OperationSAFE (OpSafe) – is a 5-session psychological First Aid program for young children traumatized by natural disaster or war. This crisis intervention project cultivates young children’s adaptive functioning and resilience. 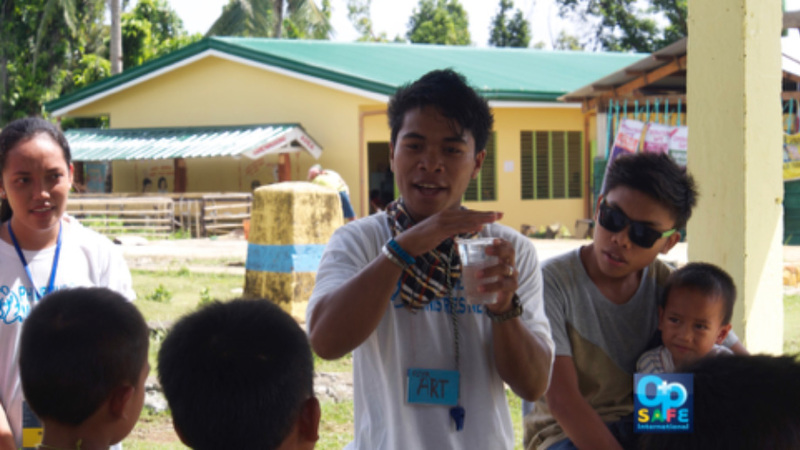 OpSafe camps have been implemented in Region 8 including Cebu, Borongan and Ormoc Cities, Guiuan and other towns of Eastern Samar specifically devastated by disasters. Local Network Development for Children at-risk – PCMN promotes the collaboration of local churches and faith-based organizations to respond collectively to the needs of vulnerable children. Active local networks comprise of more than 100 churches and faith-based ministries in Eastern Samar, Northern Samar, Western Samar, Davao City, Metro Manila, Quezon City and Caloocan City. Check donations will be processed and receipted by GLINTS. Please make your checks payable to GLINTS, with “PCMN Ministries” noted in the memo section. Up to 40,000 people fled their homes and farms as ash and pyroclastic materials continued to endanger the lives of people living around Mayon Volcano, according to Albay Governor Al Francis Bichara. The volcano began its eruption on January 14, 2018, and continued with increasing intensity since then. Evacuees are now scattered throughout Albay – in Legazpi, Camalig, Guinobatan, LIgao, Daraga, Sto. Domingo and Tabaco. They had brought their own food when they fled but their supply easily ran out. Government and private sectors gave emergency help, but the need was unprecedented as the evacuations lingered. Our local churches started giving out food rations and even offered their homes as temporary refuge, but massive amount of relief is still needed in the next few days. It would be difficult for the residents to immediately return to their homes, even if the volcanic activity subsides. 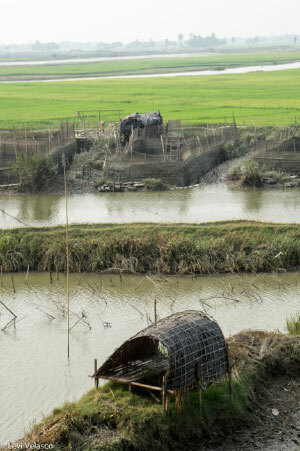 The ash fall covered their homes and especially their farms which would require time to rehabilitate. Let us help these suffering families survive difficult times. Let us pray that God will continue to bless them and comfort them and provide for their needs. The relief and development arm of the Philippine Council of Evangelical Churches is PHILRADS, established in 1980 to serve the poor and needy of the Philippines through PCEC’s network of local churches. PHILRADS (Philippine Relief and Development Services), the holistic ministry arm, responds to the emergency needs of disaster victims, provides assistance for their rehabilitation, implements sustainable community development projects (including long term poverty alleviation projects in depressed or disaster-stricken communities), and conducts disaster management seminars for local churches and communities. The Philippines is known as one of the most hazard-prone countries in the world. In a study conducted by World Bank in 2008, the country was identified as a natural disaster hot-spot with approximately 50.3 percent of its total area and 81.3 percent of its population vulnerable to natural disasters. Based on the 2012 World Risk Report published by the United Nations University Institute of Environment and Human Security (UNU-EHS), the Philippines is the third most disaster risk country worldwide. 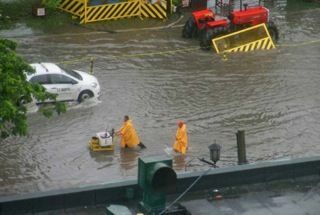 The most disastrous year was observed in 2011 with 33 disaster events mostly attributed to tropical storms and floods. GLINTS’ partnership with PCEC-PHILRADS enables concerned donors outside the Philippines to bring hope and healing to disaster-affected families and communities throughout the Philippines. Your gift of any amount brings vital assistance to those in need. Will you help? Check donations will be processed and receipted by GLINTS. Please make your checks payable to GLINTS, with “PHILRADS” noted in the memo section. PCEC-PhilRADS has provided shelter repair kits (SRKs) to thousands of victims of Typhoon Haiyan (“Yolanda”) in Central Philippines through the gifts of many generous donors. Watch below the latest video and get details. Donate now and join PCEC-PhilRADS’s work to provide transitional shelters for Filipino families who lost their homes due to the super typhoon on November 8, 2013. On November 8, 2013, typhoon Haiyan (local name Yolanda) swept portions of Central Philippines. It hit land on several places starting 4:40 am on November 8 and left the Philippine area of responsibility on November 9, 2013 at 3:30 pm. The Philippine government has estimated 11.3 million people (or 13% of the Philippine population) in the 9 regions hit by Typhoon Haiyan. There are 673,000 estimated to be displaced by the typhoon, 55% of whom are in evacuation centers, and the rest in host communities or makeshift shelters. The provinces of Leyte, Samar, Cebu. Aklan, Iloilo, and Capiz were hardest hit. Lack of sufficient food is an item in the list of most immediate threats to life. The immediate response of the Philippine Relief and Development Services, Inc. (PHILRADS), the relief and development arm of the Philippine Council of Evangelical Churches (PCEC), was to provide cash assistance to the pastors and their communities who can still access some food through traders, from its internal funds. PHILRADS also coordinated the network of churches and ministerial fellowships to response to the survivors’ immediate needs. Through the aid and speedy assistance of donors, we were able to mobilize the Cebu Province Ministerial Association (CPMA) to respond to the needs of survivors in the northern parts of Cebu. They were able to distribute 2,500 food packs to the affected towns of Daanbantayan, Malapascua Island, Medellin, Bogo, and San Remegio. Each pack contained food items that would help them survive for 5 days (rice, noodles, sardines, detergent soap, coffee, choco drink and biscuits). Relief distribution was also done in the province of Leyte. The first distribution was done in the towns of Ormoc, Kanangga, Capookan, Barugo, Carigara, and Tunga were 1,600 food packs were given to churches and their members. The second distribution of around 1,000 food packs were given to church members in the towns of Jaro, Alang‐alang, Sta Fe, Palo, and Tacloban. The food packs contained rice, sardines, canned goods, noodles, coffee, choco milk, and detergent bar. Clothing and blankets were also distributed. To maximize the reach of disaster response efforts, the evangelical community has organized the Philippine Evangelical Disaster Response Network (PEDRN) comprising of different Evangelical disaster relief organizations nationwide in order to avoid duplication, eliminate competition and enhance strategic cooperation. We hold regular weekly coordination meetings in Manila and from the field, give updates on our accomplished responses, answered needs and on the planned responses in the days to come. As we grieve for families of the thousands dead and millions who are displaced, we are humbly appealing to you to support our goal of providing 30,000 shelter repair kits. Each kit consists of GI sheets, ridge sheets, nails, coco lumbers, marine plywood, saw and hammer. It costs Php15,000 inclusive of shipping and other related expenses. After giving out more than 80,000 food packs, 5,000 shelter repair kits and close to 100 tons of various non‐food items, medical teams serving 3,963 patients and trauma counseling teams debriefing 2,817 persons, and training 420 pastors to give counseling to their communities, the need is still persistent. The need is a whole ocean and it seems that we are pouring only buckets of the solution to it. We ask for your continued partnership and prayers as we continue the rehabilitation work, particularly in shelter repair, food, medicine and trauma counseling. Again, thank you very much. We look forward for a more fruitful partnership with you in helping our countrymen in need. God bless! BISHOP EFRAIM M. TENDERO, D.D., D.L.